Sophisticated white raised "stitches" with black banding and platinum details create this contemporary bone china dinner plate from kate spade new york. Crafted of fine bone china, accented with platinum. Sophisticated white raised "stitches" with black banding and platinum details create this contemporary bone china salad plate from kate spade new york. Sophisticated white raised "stitches" with black banding and platinum details create this contemporary bone china cup from kate spade new york. 7 oz. Kate Spade Union Street Cup - Platinum - 2.5"H - 7 Oz. In the hands of kate spade, black and white is anything but basic. 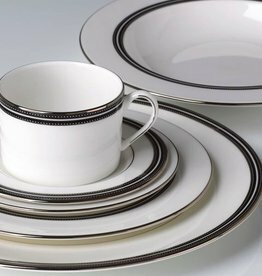 Dancing ebony stitched stripes provide a stunning contrast to the pristine china of the Union Street collection. Double "stitched" bands distinguish this sauce boat and stand. Platinum accents trace the sauce boat and stand's edges, as well as the sauce boat handle.